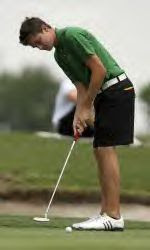 Charlotte 49ers senior all-America Corey Nagy, a three-time honorable mention all-America, shot a an eight-under par 134 to tie for first place at the U.S. Amateur sectional qualifying tournament in Blythewood, S.C. and earn a spot in this month's U.S. Amateur Championship. Nagy, who also qualified for the 2008 U.S. Amateur, posted rounds of six-under par 65 and two-under par 69 to tie Phillip Mollica for first place in the tournament which ended last week. The 2009 U.S. Amateur will be played Aug. 24-30 at Southern Hills Country Club in Tulsa, Okla. Nagy, the 2009 Atlantic 10 individual medalist, led Charlotte to its fifth straight NCAA appearance and fourth straight A-10 title in 2009. He finished the season with a team-best 73.28 stroke average. In three seasons, Nagy has finished first (2009), second (2008) and third (2007) at the Atlantic 10 Championship, earning all-conference honors each season.